This 2 bedroom villa with private pool is located in Prainha and sleeps 5 people. It has barbeque facilities, parking nearby and a gym. The villa is within walking distance of a beach. Luxury villa. 10min walk to the beach. This 2 bedroom apartment with private pool is located in Prainha and sleeps 5 people. It has WiFi and air conditioning. The apartment is within walking distance of a beach. This 4 bedroom villa with private pool is located in Bemposta (Portimăo) and sleeps 10 people. It has WiFi, barbeque facilities and parking nearby. This 3 bedroom villa with private pool is located in Penina and sleeps 6 people. It has WiFi and air conditioning. The villa is near a beach. This 4 bedroom apartment with private pool is located in Prainha and sleeps 9 people. It has WiFi and air conditioning. The apartment is within walking distance of a beach. This 3 bedroom apartment with private pool is located in Prainha and sleeps 7 people. It has WiFi and air conditioning. The apartment is within walking distance of a beach. Amazing townhouse perfectly situated in the centre of Alvor on a quiet street. Walk to amenities, attractions, restaurants, bars, cafes, shops and beach. This 3 bedroom apartment with swimming pool is located in Delgadas and sleeps 6 people. It has air conditioning, parking nearby and a gym. The apartment is within walking distance of a beach. This 2 bedroom apartment with swimming pool is located in Delgadas and sleeps 5 people. It has WiFi, air conditioning and garage. The apartment is within walking distance of a beach. This 1 bedroom apartment with swimming pool is located in Delgadas and sleeps 3 people. It has WiFi, air conditioning and garage. The apartment is within walking distance of a beach. 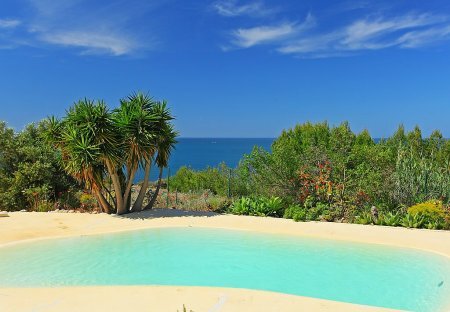 This 4-bedroom villa for up to 8 guests is located in Alvor and has a private swimming pool and. This 3-bedroom villa for up to 6 guests is located in Alvor and has a private swimming pool.